Whether it's a hybrid model or handing over the reins completely to a vendor, seeking outside help can lessen the release-of-information burden. After embarking on its journey into the land of EHRs in 2007, Florida Hospital's HIM leaders sought additional ways to streamline operations. The EHR implementation created a huge opportunity to do just that, with improved release-of-information (ROI) workflows high among the health system's list of priorities. The process had previously been entirely outsourced, but in 2009 the hospital changed to a hybrid model in which staff assumed responsibilities for processing all release requests from patients, authorizing ROI, and collecting appropriate records for release. At that point all information is delivered to HealthPort, the hospital's ROI vendor, for final administrative process, distribution, invoicing, and collections. ROI is a complex process. At Florida Hospital, an acute-care, not-for-profit health system based in Orlando, thousands of records are processed each month and in any given day more than 500 requests are made through its centralized call center, not to mention the hundreds more received from walk-in patients and those requesting information through the health system's patient portal. Moving from a fully outsourced ROI process to a hybrid model was not about reducing organizational workflow, however. In fact, managing the bulk of the process in-house actually creates more work for the HIM department and will result in additional hires as departmental leaders continue to take on more ROI responsibilities. "We wanted to go to a partnership so that our employees could learn and grow in a model previously outsourced," says Assistant Director of HIM Julia Nasternak. "We are committed to our organization's missions and values and we wanted our onsite employees representing those missions and values. It's been a wonderful benefit and an honor for us to take ownership of the process, seeing who our requestors are; it has also really helped Florida Hospital's brand." ROI employees are able to directly interact with patients, putting a face to the hospital, which is not always the case when the process is fully outsourced. Hospital employees also are able to engage patients, and guide and educate them about what information can be released and why, based on specific requests. Once a hospital employee authorizes a release, the information is placed into an electronic queue in the EHR and assigned to HealthPort to finalize the remaining administrative tasks, including distribution of the records to the requestor. "We manage the queue while HealthPort makes sure the information is indexed, processes the request, and determines whether information is paper shipped or delivered through the patient portal," Nasternak says. "HealthPort processes exactly what we've sent." Throughout the entire process, Florida Hospital employees track every request, the exact time it was initially entered, when the vendor received it, and when the record was packaged, shipped, and delivered. They also can run reports to track and trend top requestors and the reasons for each request. When ROI is fully outsourced, the vendor handles every step of the release, a model preferred by many organizations, including Southcoast Health, a New Bedford, Massachusetts, health system of three hospitals and 31 practices. Because of its multiple locations, about 80 in total, leaders there believe a fully outsourced ROI process is the key to long-term success. "Outsourcing ROI gives our team peace of mind," says HIM executive director Bettyann Carroll. "Everything is handled in a consistent manner, with the highest integrity of services." In general, outsourcing ROI is based on two principles: improving the patient experience and economics. Third-party vendors specialize in their respective roles so it makes the most sense to let them handle the heavy lifting, Carroll says. "Efficiencies—it's what they're really good at," she notes. Historically, ROI is conducted in one of three ways: in-house, outsourced, or a hybrid of the two. When considering an outsourced model, HIM leaders must evaluate internal processes to determine the direction best suited for the organization. Fully outsourcing means that a vendor performs all ROI functions, including sending and receiving mail and faxes, and handling walk-in requests, collections, and all administrative tasks. Staff also are hired, trained, paid, and managed by the vendor. • customer service, including addressing walk-in, portal, and phone requests. In a conventional hybrid model, HIM staff members load information into a workflow queue within the EHR or practice management system where it can be accessed remotely by the vendor. They also collect and authorize requests, meet with patients and other requestors to process intake forms, and collate the appropriate records. The outsourcing vendor, whose staff is usually off-site, provides all back-end services, including a second authorization request, mailing or electronically uploading the information, and invoicing and collecting fees. The health care organization and the vendor share revenue. Organizational leaders must determine the approach that best meets their needs, accounting for the effects on administrative workflows and the patient experience. 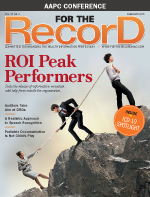 But no matter how ROI is handled, hospital leaders must prioritize customer experience. It's a complicated process no matter how it's managed, says Angela Dinh Rose, MHA, RHIA, CHPS, FAHIMA, director of HIM practice excellence at AHIMA, who notes even geography is a factor because laws and regulations mandating how health systems can prepare and deliver information to patients varies from state to state. Dinh Rose, a coauthor of AHIMA's ROI toolkit, sees value in all three ROI approaches. For organizations that outsource, however, she says there are clear benefits, including lessening administrative burdens. "Vendors bear the full responsibilities of the ROI," she says. "It's their sole job to handle release of information appropriately and ensure all laws are complied with." Except for urgent requests, the University of Wisconsin Hospitals and Clinics outsources its ROI through its vendor, IOD, which operates on-site from within the HIM department. Outsourcing eliminates a tremendous amount of administrative complexities, says Dawn Paulson, MJ, RHIA, assistant director of HIM. "We don't have to staff it or manage it and they cover our off hours and holidays," she notes. "Their technology and full-service staffing allow them to be far more advanced in the release function than we could be." Despite being intrigued by handling the process in-house, Paulson says ROI is too overwhelming to consider such a move. "It's a lot more complicated than people think," she says. "It's more than pushing a button on a copy machine. With regard to accuracy, we can't accept anything less than perfection as patient safety, legal/regulatory requirements, payment of claims, and overall customer service relies on that." Vendor agreements must contain both broad and specific mandates. Holly Roberson, HIM director at Florida Hospital, says it's critical to evaluate the vendor's technology used to process requests, scrutinize security and breach measures, and determine whether ROI education is available to in-house staff. Breach and risk assessment protocols must be clearly outlined in the contract. The vendor also must show proof of HIPAA compliance. Is the vendor's staff receiving ongoing privacy and security training? In addition, services delivered, workflow issues, turnaround times, after-hours customer support, and equipment needs must be addressed. Turnaround times are based on the request type, with most records being released within seven days. The hospital can determine exceptions, while state laws also may provide guidance. At the University of Wisconsin Hospitals and Clinics, the maximum turnaround is five days. Paulson says an exception occurs only when extenuating circumstances result in an inability to complete documentation at the time service is provided. As for contract lengths, a one-year term with annual renewals is the industry standard. Although not necessarily part of the contract process, HIM leaders must investigate potential partners' track records. Run reference checks and determine the vendor's definition of a successful, prosperous relationship. Also, determine how well candidates communicate with clients. By what medium do they answer questions? Are they available for follow-up, guidance, and support, especially prior to any deal being finalized? The level of outsourcing determines how involved hospital staff members need to be in the ROI process. Full outsourcing means the HIM team will have fewer day-to-day interactions with the collection and ROI. In those cases, most internal involvement comes from leadership, who manages and directs the process as needed. "In our organization, we have a little more involvement with our vendor than others may," Paulson says. "We involve them in all our testing, upgrade enhancements, and educational training. They're an extension of us." Paulson and an IOD representative conduct weekly status updates to discuss priorities and outstanding issues, and to strategize on how to prepare for any upcoming spikes in information requests. For example, when school starts in the fall and when patients switch insurance plans in January, ROI requests jump significantly. The meetings also help identify issues with release reports. Southcoast Health, with facilities in Rhode Island and Connecticut, has more complex needs than many health systems. The HIM department works closely with its vendor, MRA Health Information Services, even though the process is fully outsourced. A Southcoast Health manager is the primary ROI contact, working collaboratively with the vendor's on-site team. "There are points where we connect and complement each other for the service, and work together on policies and procedures," says Ann Dooley, MRA's director of disclosure management. "Remote staff also assists practices." Dinh Rose says security issues may rank first on the list of health care organization's outsourcing concerns. Roberson concurs, noting that it's the hospital, not the vendor, that ends up making the headlines for privacy indiscretions. "As a patient in a facility, you trust [the hospital] when they're touching your information," she says. "It's peoples' personal information. Trust is the No. 1 thing." Examples of ROI-related breaches include releasing the wrong patient's information, sending files to the wrong address, and faxing records to the wrong number. Besides security concerns, HIM leaders also must pay extra attention to vendor performance during new hospital initiatives, high-volume processing times, and at the beginning of the partnership. Carroll cautions that some vendors will overpromise, underdeliver, and overextend themselves at times. "There are vendors where you only see your contacts once a month, if that, because their territory is so huge so staff of the outside vendor is not managed," she says. "You need to ensure the right levels of resources to manage the process and request in-person, face-to-face meetings on a regular basis." Whether ROI is managed internally or through a vendor, the process must be monitored to determine whether it's meeting the appropriate standards. According to AHIMA guidelines, "An organization can write policies and define procedures, but it has no way to know they are working without performing a periodic checkup. Regardless of the method an organization chooses to evaluate ROI performance, it is the organization's overall management practices that define the foundation for accurate and compliant release of information." While outsourcing can have a tremendous effect on ROI functions, from freeing up resources to improving administrative processes, its success varies by health system. Measuring its impact can be an inexact science but, like AHIMA guidelines suggest, it's crucial to keep tabs on ROI performance. "We've been able to monitor customer satisfaction and we've seen a great impact in the level of customer service and the level of education we're able to provide," Roberson says. "It's not always black and white but we're now able to do a lot of patient and requestor education." Nasternak says converting to a hybrid model has raised HIM's profile. "The partnership has really allowed us to become a further resource to the rest of Florida Hospital. For example, when the business office or other departments have a question regarding information release, they call us," she says. "We can take that information and continually improve HIM's role throughout the entire organization. "For us, [the vendor partnership] gave us a great opportunity to provide great value, to learn so much more, and to be more involved in our community than just having a vendor come in. Our [patient] community has grown and so we're much more involved." — Scott E. Rupp is a Florida-based freelance journalist whose writing appears regularly in health care, IT, and business-oriented publications.